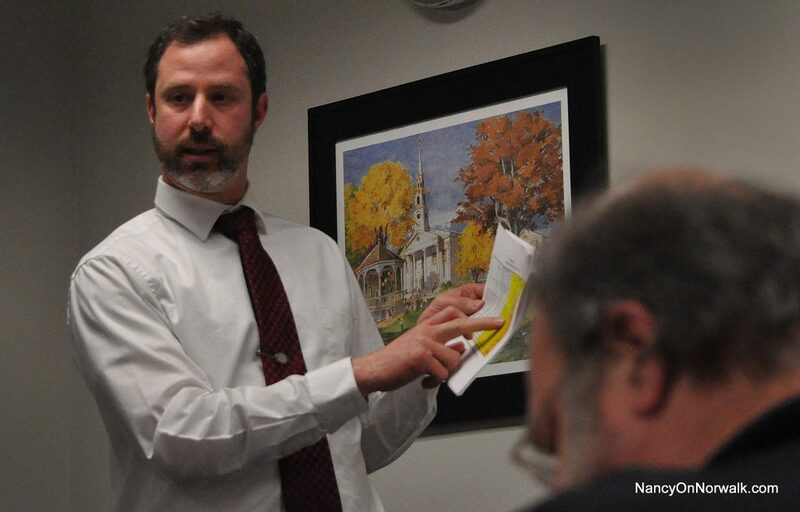 Human Relations & Norwalk Fair Rent Department Director Adam Bovilsky speaks to the Common Council Personnel Committee in February. Human Relations & Fair Rent Department Director Adam Bovilsky has been selected by the Norwalk Housing Authority to be NHA’s new executive director, Brenda Penn-Williams said Tuesday. Bovilsky appears set to replace Curtis Law, who announced his retirement last year but was paid to continue on through March 31, interim executive director Thomas Hickey said. Neither Penn-Williams nor Rahoul Dupervil, both NHA Commissioners, would say when Bovilsky will start. Bovilsky on Wednesday declined to comment. Law’s wife, Candace Mayer, announced her retirement as Deputy Director last year, effective Jan. 2, a source said. Mayer is still at work; she did not return a Tuesday phone call. Bovilsky’s appointment was pronounced as “exciting” Tuesday by Nicole Ruffin of the NHA Human Resources Department, who said she welcomed change. Bovilsky has led Norwalk’s Human Relations and Fair Rent Department since June 2007, according to his LinkedIn page. Mayor Harry Rilling on Wednesday declined to confirm Bovilsky’s appointment to the Housing Authority and did not address the issue of filling Bovilsky’s place on the city’s staff. Bovilsky graduated from Yale University in 1997 with a Bachelor of Arts degree in religious studies and from Boston College Law School is 2004. Mayer addressed NHA residents in their April newsletter, lauding Law’s “incredible vision” and crediting him for achieving nationwide recognition for NHA and the $30 million United States Department of Housing and Urban Development (HUD) Choice Neighborhoods Initiative grant issued to support the reconstruction of Washington Village and rebirth of the surrounding neighborhood. The Housing Authority’s Board of Commissioners has added two new members since the last time NancyOnNorwalk stopped in. Duperville was appointed by Housing Authority residents to be a tenant representative, while Sheri Brown, a former Housing Authority employee, was selected by Rilling in June to fill the seat vacated by Lisa Nuzzo less than a year after being appointed in January 2016. Duperville is on the Human Relations Commission and is a founding member of the United Haitian-American Society. Brown worked in NHA resource development and communications from 2010 to 2014, according to her resume. “I’ve known Ms. Brown for many years and served with her on the Weed and Seed Program. She was appointed because of her skills and ability,” Rilling wrote Wednesday. That The SoNo Collection is currently under construction with no sign of a hotel should surprise no one who is following Norwalk politics, but what has become of the $3.5 million GGP promised to pay? To recap: GGP, formerly General Growth Partners, got city approvals to build its mall at the intersection of West Avenue and North Water Street to include a hotel, but last year asked city permission to excise the planned hotel from the project. That was granted in return for $3.5 million payment to Norwalk, a figure derived at least partially from the lost tax revenue the hotel would have provided. The money has been paid, Rilling said on April 16. “It is set aside as of this moment on a balance account until we decide how best to use it,” he wrote. Norwalk Fair Housing Officer Margaret Suib in December suggested that the $3.5 million be used as seed money to help provide housing for people who make between $35,000 and $65,000. Developer Paxton Kinol in May suggested it be used for better Wall Street/South Norwalk connectivity. “We indicated out focus would be on the South Norwalk area so I’m expecting to discuss possibilities with Council leadership and other stakeholders. Then any proposals would have to proceed before appropriate board, commissions, and Council,” Rilling wrote. Common Council member Faye Bowman (D-District B) in May successfully fought to have language inserted into GGP’s approval, indicating that the $3.5 million would go to South Norwalk, although Attorney Eric Bernheim pointed out it would be non-binding. “I am not aware of any conversations the Mayor has had regarding the $3.5 million and he has not reached out to myself and possibly also Councilman Simms (but double check with him) in regards to implementing a process to distribute the funds. Some concerned residents from South Norwalk did reach out to the Mayor regarding this but have not received a response to my knowledge. Bob Barron however did confirm that it has been received by the City. “I would like to see a few hundred thousand go towards non-profits serving South Norwalk that would have normally benefitted from a larger CDBG pot for public services than is available for 2018. Eversource is investing $80 million this year to trim trees and remove hazardous trees in Connecticut, to help prepare the energy system for storms, “carefully balancing the need for electric reliability with community aesthetic,” a press release said. That includes trimming trees “along some 77 miles of roads in Norwalk,” spokesman Mitch Gross said. Eversource notifies customers in advance if trimming is necessary on their property, the press release said. Will be fun to see how the reported $3.5 million is spent. For more police to deter crime in SoNo. Or redirect traffic. Beefed attention to public works outlays incurred by the huge Mall, e.g. street repairs, plowing, sewers, water supply, additional street cleaning, snow removal, trash removal, etc. Will the Fire Dept. need new equipment. More City inspectors. Will any support funding made available to local merchants forced out by the Mall. Or will our Mayor just say the $3.5 million “moves Norwalk forward” without any additional outlays. Even GGP acknowledges new Malls impose additional costs to the City. The Mall likely is our last opportunity for this generation to recreate an attractive Downtown. Sadly our Mayor and Common Council have made no visible effortssto use the Mall as a “catalyst” to dramatically change our shabby Downtown. Some of us still remember when Downtown was attractive to visit. Another instance of avoiding “professional search” for City Hall ? Congratulations to Mr. Bovilsky. He has always done his job with diligence and without fanfare.